There’s nothing worse than being caught out in the rain without an umbrella. (There are worse things, but whatever.) If you happen upon a DyDo vending machine, however, you can borrow one for free! NariNari reports that Osaka-based drink maker DyDo is adding the free-loaners at sixty of its vending machines. This is based on the honor system, so if you don’t return the umbrella, the next person cannot use it. In Japan, loaner umbrellas aren’t that uncommon. You see them at train stations, city halls, and even on buses. 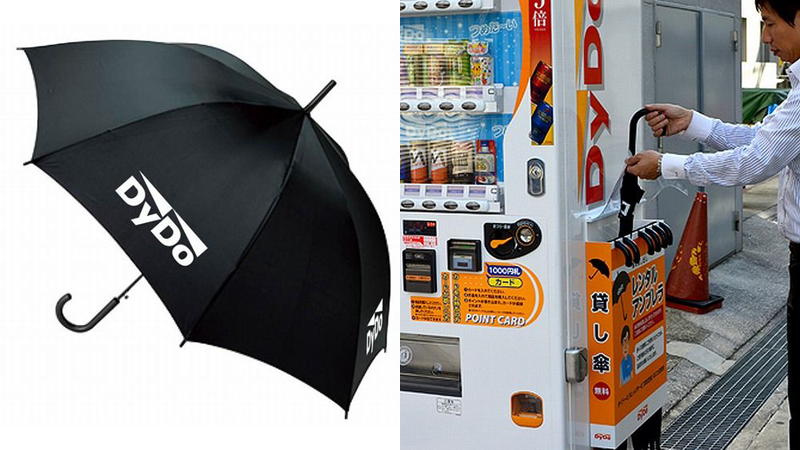 Heck, Taito arcades started offering loaner umbrellas a few years back for customers caught in sudden downpours. However, this is the first I’ve heard of vending machines offering free loaner umbrellas.